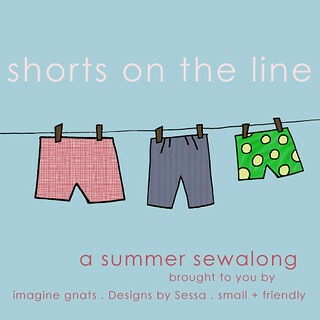 Inder Loves Folk Art: Shorts on the Line! My guest post (featuring chambray cargo shorts with pops of color) is up at Imagine Gnats today, and there is a line-up of awesome guest posts scheduled for next couple of weeks! Go check it out! Gratuitous photo of Joe's cute tummy. Awesome! I'm so excited that you are a part of this sewalong! No way! Those are some awesome shorts! Super cute shorts! I especially like the pleated pockets and the topstitching... oh, yes, and the curls and the tummy. Fantastic shorts and I love the green topstitching on black. Fab pocket tutorial too. So cool to see you on the line up for this series. they're great! i love the pops of green and the changes you made to the pattern. and he's a cutie for sure!! I love the green!! The shorts look awesome! And, it seems that you and I were on a similar wave length...with cargo pockets! ;) Oh, and I love the chambray too!! !